Among employed adults, major depression is a leading cause of work absences (absenteeism) and impaired work performance (presenteeism) as well as short-term and long-term work disability. Depression is one of the largest and fastest growing categories of work disability claims filings in the public and private disability insurance sectors. Despite advances in depression detection, diagnosis, and treatment, most adults with depression receive no care or suboptimal treatment. Research also shows that depression treatment by itself, even when it reduces symptoms, does not adequately restore work functioning. Because untreated depression results in enormous costs to companies, many employers have invested in work-based depression interventions. Little is known, however, about the prevalence, quality, and effectiveness of these interventions. This project incorporated an environmental scan and key informant interviews to summarize current knowledge regarding the adoption and benefits of work-based depression programs, identify key elements of successful programs, summarize gaps in our understanding of these programs, and identify opportunities to expand these program. This report was prepared under contract #HHSP23320100026WI between HHS's ASPE/DALTCP and Westat, Inc. For additional information about this subject, you can visit the DALTCP home page at https://aspe.hhs.gov/office-disability-aging-and-long-term-care-policy-daltcp or contact the ASPE Project Officer, Judith Dey, at HHS/ASPE/DALTCP, Room 424E, H.H. Humphrey Building, 200 Independence Avenue, S.W., Washington, D.C. 20201. Her e-mail address is: Judith.Dey@hhs.gov. DISCLAIMER: The opinions and views expressed in this report are those of the authors. They do not reflect the views of the Department of Health and Human Services, the contractor or any other funding organization. This report was completed and submitted on November 24, 2017. TABLE 2: Controlled Studies of Work-Focused Interventions for Depression Conducted in U.S.
Study Consultants: Robert Drake (Westat), Howard H. Goldman (University of Maryland School of Medicine), Marlene Dines (Kaiser Permanente). Westat conducted this study on behalf of, the U.S. Department of Health and Human Services (HHS), Office of the Assistant Secretary for Planning and Evaluation (ASPE) under contract #HHSP23320100026WI/Task Order # HHSP23337005T. The authors gratefully acknowledge the support of our project officer, Judith Dey, PhD for her useful comments and guidance throughout the course of the study. We further want to express our appreciation to Robert Drake, MD, PhD for his clinical insights, and his thoughtful review and edits to our preliminary draft. Most importantly, we would like to recognize and thank our broad array of content experts who generously gave of their time and knowledge to ensure this report reflected a comprehensive composite of real world considerations when mounting and executing employee-based health and wellness services. These experts represented a broad range of experiences, companies and national service associations and included the following: David Adler, MD; Cathy Baase, MD; David W. Ballard, PhD; Richard Bedrosian, PhD; Tim Blevins, MBA; Catherine Bodnar, MD; Jenny Haykin, MA; Mark Jones; David Levine, MSW; Clare Miller, PhD; Paul Pendler, PsyD; Laurel Pickering, MPH; Patricia Purdy, MEd; Nicole Stelter, PhD; Chester Taranowski, PhD; and, Hyong Un, MD. Among employed adults, major depression is a leading cause of work absences (absenteeism) and impaired work performance (presenteeism) as well as short-term and long-term work disability. Depression is one of the largest and fastest growing categories of work disability claims filings in the public and private disability insurance sectors. Work loss has a range of adverse economic and human consequences for affected workers and their families, employers, insurers, and federal disability programs. In the commercially insured United States population, individuals with depression are among the costliest of all illness groups, and most of the costs of depression are directly related to employment (i.e., cost attributable to days absent from work and poor work performance). Despite advances in depression detection, diagnosis, and treatment, most adults with depression receive no care or suboptimal treatment. Research also shows that depression treatment by itself, even when it reduces symptoms, does not adequately restore work functioning. Summarize current knowledge regarding the adoption and benefits of work-based depression programs. Identify and describe key elements of successful programs. Identify important gaps in our understanding of work-based depression programs. Summarize opportunities for expanding work-based depression programs. Describe how to measure the longer-term impacts on employment and disability of work-based depression intervention programs. Our project used two strategies: an environmental scan and a synthesis of a series of key informant interviews. For the environmental scan, we systematically reviewed: (1) work-based depression treatment programs as reported in websites for various employee health promotion programs; (2) published literature; (3) survey findings; and (4) other sources, such as reports, white papers, and newspaper articles. The key informant interviews consisted of 17 qualitative interviews with 18 respondents with extensive experience in work-based depression programs representing three stakeholder groups: employers, service providers, and insurers. Our environmental scan examined the literature on four types of work-based depression programs: EAPs, depression case management, work-based health promotion, and disability management. We identified a number of surveys reporting the prevalence and types of depression services offered within these programs. Most large and medium-sized companies offer EAPs and health promotion programs. We also conducted a rigorous systematic review of published studies of work-based depression programs. Five trials met our inclusion criteria, including four randomized controlled trials and one quasi-experimental study. The studies included evaluations of comprehensive programs, EAPs, and a mobile application for depression treatment. Two controlled studies of an employer-based, work-focused program for depression show moderate to large effects in reducing depressive symptoms and improving work outcomes. Based on this literature and studies of depression treatment conducted outside the workplace, we proposed a set of critical ingredients to be incorporated into comprehensive work-based depression programs. Our key informant interviews addressed the state of work-based care for depression, innovative programs and initiatives, the state of evidence on program performance, and perceived strengths, gaps, and opportunities. Key informants identified many barriers to ensuring effective work-based depression programs, including stigma, inadequate supply of adequately trained providers, lack of coordination among programs and providers, and costs of care. Conversely, they noted several innovative approaches to depression treatment, including innovations in EAPs, physician payment and care delivery, health promotion programs, and absence and disability management services. They also identified five general strategies to promote better depression services (using data and analytics, integrating services and vendors, changing the culture regarding mental health, changing policies, and incorporating work assessments into depression care). Work-based depression interventions can reduce depression and improve work performance. But these programs require standardization and systematic research under real-world conditions. The United States research comprises only a small number of the controlled trials conducted globally. International research, including studies of return-to-work programs for workers on sickness leave for depression, has identified effective program elements, which need research to evaluate applicability in the United States Systematic reviews have identified several components common to many effective work-based depression programs: screening, referral, psychoeducation, care management, counseling, medication, and workplace modifications. In addition, employers, insurers, EAPs, and other stakeholders have begun to use technology-based interventions, which also require large-scale effectiveness trials. The most promising approach in the United States is Be Well At Work (BWAW), a comprehensive, standardized program, which has shown positive results in two controlled trials (two replication trials are in progress). BWAW offers population-level screening in the workplace using a web-assisted, privacy-protected, health-screening tool. All participants receive immediate, personalized results and recommendations; workers screening positive for depression are eligible for telephone-based care consisting of care coordination, cognitive-behavioral therapy adapted for work issues and coaching to modify barriers to effective work functioning. BWAW reduces depression, improves work performance, and decreases absenteeism. Despite these promising studies, the evidence for effectiveness under real-world conditions is minimal, and the field needs more rigorous research at all phases of program development through implementation. Comparisons of different interventions or intervention approaches, including effects on long-term mental health, employment, disability, and cost, are paramount. Information on the prevalence of work-based depression interventions occurs largely in the gray literature and, as expected, is generally not of research quality. Surveys of health promotion programs, EAPs, and disability management programs provide incomplete data on work-based depression services, which are not their focus. Most studies have serious methodological limitations, including unrepresentative samples, low response rates, and brief survey instruments. The surveys typically examine a particular type of program (e.g., health promotion programs or EAPs) with minimal attention to depression treatment. They do not usually address linkages between different programs, limiting our understanding of comprehensive services within any organization. The field needs comprehensive surveys of employer-based depression treatment using rigorous survey methodologies and large representative samples of employers to inform policy. Our key informant interviews complemented the environmental scan by providing information on trends, innovations, and challenges. Participants emphasized the importance of understanding the work context and how it influences current and future approaches to depression care. First, companies vary with regard to which departments and individuals are responsible for making decisions about depression care sponsored by the company, and how well informed the decision-makers are about this area. In many cases, internal decision-makers confer with external benefits consultants, insurance brokers and/or depression service suppliers. Second, these decisions are rarely focused specifically on depression care. Depression care is part of a larger set of health or benefits-related decisions. Third, in terms of service delivery, many companies have multiple contracts for care (e.g., one contractor provides the EAP and another provides primary care), and these may be managed in separate departments, which fragments the care and makes evaluations of its impact difficult. Fourth, companies need but often lack quantitative data, such as depression screens, EAP utilization, and claims, to improve management decisions. Both the environmental scan and the key informant interviews indicated that, despite efforts to provide services, a variety of barriers persist. Employees do not engage in care, and their depression often goes untreated, because of the stigma of mental illness and their lack of awareness of depression and treatment options. Employers rarely offer a well-coordinated continuum of comprehensive depression treatment, instead offering depression screening, brief counseling, referrals, diagnosis and treatment in separate programs, which may not work collaboratively. Insurance for depression treatment in primary care often does not cover collaborative care or other evidence-based practices. Finally, current approaches to depression care often fail to directly address functional outcomes, which are important to both employers and employees. While outcomes such as reduced absences, improved work performance and disability prevention are clearly important to many stakeholders, these priorities have not translated into current practices and policies. We identified several targets for further research, especially for developing national policy. These include a conceptual framework for work-based depression programs, high-quality surveys, better data and analytic frameworks, studies of disability prevention, research on the integration of services and organizations, high-quality effectiveness studies using real-world resources, long-term follow-up research, and economic analyses. Depression is the leading cause of medical disability in the United States, accounting for nearly 10% of all medical disability (Mathers, Fat, & Boema, 2008). According to the National Comorbidity Study Replication, the lifetime prevalence of major depressive disorder in the United States was 16.2% and the 12-month prevalence was 6.6% (approximately 13.6 million United States adults) (Kessler et al., 2003). These authors also reported that 59.3% of people with 12-month depression experienced severe or very severe role impairment. About 7.6% of employees in United States companies experience depression annually (Bimbaum et al., 2010). Depression presents a major economic problem for employers because of its high prevalence (Kessler et al., 2005; Lerner et al., 2017), negative impact on work functioning (Dewa, Thompson, & Jacobs, 2011), associations with recurrent and long-term absences from work (Bültmann et al., 2005), and with entry on the pathway into disability insurance programs (Schuring et al., 2013). In addition, depression is often comorbid with other medical illnesses and has a strong negative impact on treatment and course (Cimpean & Drake, 2011). People with comorbid chronic medical conditions and depression are more likely to use doctors, emergency departments, and hospitals (Evans et al., 2005). Finally, people with depression have high rates of early mortality, including suicide (Kessler, Borges, & Walters, 1999). Depression takes a huge toll on workers, their families, and employers. It has a profound negative impact on ability to work. Among employed adults, major depression is a leading cause of work absences and impaired work performance (Lerner & Henke, 2008) as well as short-term and long-term work disability (Integrated Benefits Institute, 2013). Depression is one of the largest and fastest growing categories of work disability claims filings in the public and private disability insurance sectors (Drake et al., 2016). Work loss has a range of adverse economic and human consequences for affected workers and their families, employers, insurers, and federal disability programs. Employees who are clinically depressed or who have depressive symptoms are less productive workers and represent an enormous cost to business and society in terms of lost productivity (Goldberg & Steury, 2001; Kessler et al., 2006). Productivity costs far exceed those of medical care costs for depression treatment (Lerner et al., 2017). The total societal cost of depression for the United States is enormous and continues to rise. In 2000 it was an estimated $83.1 billion, of which employers bore the largest portion ($51.5 billion; 62%) in lost work productivity (Greenberg et al., 2003). By 2010 it had increased to $80.4 billion, of which employers bore the largest portion ($43.0 billion; 54%) (Greenberg et al., 2015). Another study with higher estimates concluded that the annual costs of depression to American industry was $44 billion, of which $24 billion was due to absenteeism and reduced productivity, $8 billion attributable to suicide, and $12 million in direct care costs (Paul, 2003). Estimating costs is complicated, but whatever the costs are to business, they far exceed what most employers assume (Lerner et al., 2017). Depressed workers have high rates of both absenteeism and presenteeism(defined as showing up for work but having reduced productivity due to illness). Limitations in work performance among depressed workers persist over time, even after depressive symptoms remit (Adler et al., 2006). Moreover, depression often leads to permanent disability and departure from the labor market. People with depression are the single largest diagnostic group receiving Social Security disability payments, either Social Security Disability Insurance (SSDI) or Supplemental Security Income (Mann, Mamun, & Hemmeter, 2015). Despite these realities, "The sad truth is simply that most businesses do not provide a level of attention and investment in mental health conditions that corresponds to their level of prevalence and cost burden" (Attridge, 2008). Care may be provided directly (e.g., an employee assistance program [EAP] offering on-site services) or indirectly (e.g., through an employer-sponsored insurance plan). We refer to these collectively as work-based depression care. Employers sometimes assume that they are satisfying the need for depression care for their employees through employer-offered health insurance. In fact, most employees with major depression receive referrals to external providers for extended, intensive, or medical treatments. They also may seek treatment directly from medical care providers through their health insurance plan, sometimes for recognized depression but often for medical conditions complicated by unrecognized depression. In 2009, prior to full implementation of parity legislation and passage of the Affordable Care Act, 80% of employers in the United States sponsored mental health benefits coverage (Society for Human Resources Management, 2009). Thus, insurance companies have been and continue to be the predominant payers for depression treatment. Insurance coverage for depression treatment varies widely in terms of benefit designs, providers, co-payments, gatekeepers, and linkage between medical care and behavioral health. Most employees with depression symptoms receive initial assessment and treatment through primary care. Only a minority of depressed patients receives any care from a mental health specialist, and primary care has long been the de facto mental health system in the United States for treatment of common disorders such as depression. Managed care organizations often administer health insurance benefits. Employees or their physicians may need to obtain authorization from managed care personnel for coverage of specific depression treatments. Managed care organizations sometimes proactively contract for depression services that then are offered as part of the benefits package to the employee. What is the impact of depression treatment on work outcomes when it is provided in settings outside the workplace? A 2004 meta-analysis of four randomized controlled trials concluded the impact on employment outcomes was significant but small (d = 0.12) (Timbie et al., 2006). An early review of the effects of medication or psychotherapy for depression concluded that when patients improved symptomatically, their work outcomes also improved, but that work recovery took considerably longer (Mintz et al., 1992). Two recent studies examining the impact of medications and evidence-based psychotherapy on work outcomes have similar findings. The Sequenced Treatment Alternatives to Relieve Depression study, a stepped treatment trial of second generation antidepressant medications, concluded that employed patients who responded to medication treatment also showed improved work outcomes (Trivedi et al., 2013). A controlled trial comparing cognitive therapy to an antidepressant treatment found better 2-year employment outcomes for the cognitive therapy group with these findings limited to treatment responders during the first 4 months of treatment (Fournier et al., 2015). For treatment of clinical depression, collaborative care, a treatment combining medical and psychosocial depression treatment in primary care settings (Unützer, Katon, & Callahan, 2002), is considered an evidence-based treatment, based on several systematic reviews. A meta-analysis of 37 randomized controlled trials of collaborative care found that depression outcomes were improved at 6 months (d= 0.25) and up to 5 years (d = 0.15) (Gilbody et al., 2006). An update based on 69 studies found significant effects of collaborative care for a range of outcomes, including improved depression symptoms (d = 0.34) though the effect size for quality of life/functional status was small (d = 0.12) (Thota et al., 2012). The general finding, then, is that several well-defined depression treatments provided outside the workplace are widely accepted as evidence-based. However, depression treatment by itself, even when effective at reducing symptoms, does not adequately restore functional effectiveness at work (Lerner et al., 2017). Despite advances in depression detection, diagnosis and treatment, most Americans with depression receive no care or suboptimal treatment (Wang et al., 2005). Most would expect to receive help from their primary care physicians, but depression detection, diagnosis and treatment in primary care often do not follow guidelines. Most working adults also lack access to evidence-based depression treatment through their employer. The available work-based depression treatment programs are diverse and of unknown effectiveness. A national online survey of over 1,500 employees conducted by the American Psychological Association found that only 45% of respondents reported that their employer provided resources to help meet mental health needs (http://www.apaexcellence.org). A national survey of employer-based health promotion programs yielded even more discouraging estimates of the penetration of effective interventions for depression in the workplace (Mattke et al. 2013). This survey found that among large companies, 51% offered health promotion programs and 53% screened for depression. Overall, less than 10% of employees received screening for depression in work-based programs. Despite these discouraging statistics regarding unavailability and underutilization of work-based depression treatment services, depression is a treatable condition and most people recover fully with early intervention, as suggested by the large literature on evidence-based treatments for depression based on decades of clinical research. There are many reasons for intervening early for depression. Once an employee goes on sick leave, the probability of returning to work decreases as the length of time out of work increases (Roelen et al., 2012). Moreover, the long-term negative effects of unemployment are profound, regardless of the reason for initial separation from the workforce. The adverse effects of unemployment include increased depression, alcohol abuse, isolation, hopelessness, decreased self-esteem, and suicide (Blustein, 2008; Luciano, Bond, & Drake, 2014; Stam et al., 2016; Waddell & Burton, 2006; Warr, 1987; Yur'yev, et al., 2010). In addition to psychological impact, intervening early for depression may have economic benefits. Once the period of unemployment continues past critical milestones related to exhaustion of sick leave benefits, both employers and employees have economic incentives for permanent termination of employment. Because of lower productivity for depressed workers (including the risk for extended periods of sickness leave), employers have an incentive to encourage such workers to take a severance package and apply for disability benefits (Burkhauser & Daly, 2011; Contreary & Perez-Johnson, 2016). Employers often conclude that it is more cost-effective to give a severance package and to encourage workers to apply for SSDI rather than to facilitate their return to work (Burkhauser & Daly, 2011). Disability policy influences employer and employee decisions. In the United States, the employer's financial responsibility to workers on sick leave is limited. By contrast, disabilities policies in other nations have insured that employers have more stake in the long-term outcomes of their workers. For example, in the Netherlands, the Federal Government changed disability regulations to hold employers responsible for paying workers benefits for more extended periods of sickness leave. (Previously the Federal Government paid these benefits.) As a result, Dutch employers became invested in rehabilitating employees, and applications for permanent disability benefits declined with this policy change (Burkhauser & Daly, 2011). For current employees who are depressed or at risk for depression, several interventions have been found effective, either as stand-alone interventions or in combination with a package of services. These interventions include: screening and psychoeducation (Lerner et al., 2012; Lerner et al., 2015b; Wang et al., 2007), cognitive-behavioral therapy (CBT) interventions (Arends et al., 2014; Joyce et al., 2016; Reme et al., 2015), antidepressants (Trivedi et al., 2013), and work-focused interventions including CBT strategies addressing person-level barriers to effective functioning and barriers related to the organization of work (e.g., work routines and characteristics of the physical and psychosocial work environment) (Lerner et al., 2012; Lerner et al., 2015b). A review of the international literature on work-based disability prevention programs for mental disorders concluded that facilitation of access to treatment and workplace-based, high intensity psychological interventions had an effect on work functioning (Pomaki et al., 2012). Employers have potential economic motivations for addressing depression in the workplace. Large-scale implementation of effective treatments for depression could theoretically reduce costs by decreasing symptoms and improving worker productivity (Simon et al., 2001). Health promotion programs rarely report costs for work-based depression programs, and only a few studies have examined cost-effectiveness or cost offsets in terms of reduced disability costs (McCulloch et al., 2001) and improved work performance (Wang et al., 2006). Summarize the current state of knowledge regarding the adoption and benefits of work-based depression programs. Map out how evidence can be developed to measure the longer-term disability and employment impacts of work-based depression intervention programs. Our project had two components: an environmental scan and a synthesis of a series of key informant interviews. For the environmental scan, we systematically reviewed: (1) work-based programs as reported in websites for various employee health promotion programs; (2) published literature; (3) survey findings; and (4) other sources, such as reports, white papers, and newspaper articles. The key informant interviews consisted of semi-structured interviews with employers, providers, and insurers chosen for their extensive experience and knowledge regarding work-based depression programs, including leaders responsible for developing innovative programs. Our environmental scan had two main components: surveys of work-based depression programs and studies evaluating the effectiveness of work-based depression programs. For the first component (surveys of work-based depression programs)we identified the types of work-based depression programs, describe their characteristics and prevalence, and document employee access to these programs and to work-based depression services. We found the most useful documents to answer these questions primarily in the gray literature (e.g., websites and unpublished reports). For the second component (studies evaluating the effectiveness of work-based depression programs) we conducted a literature review of the effectiveness of work-based depression programs. For this component, we conducted a formal systematic review of the scientific literature using conventional literature search methods and review procedures. Surveys of Work-Based Depression Programs. Work-based depression programs are services offered to employees through the workplace to detect, diagnose, and treat depression. To identify the types of work-based depression interventions, we conducted a series of electronic searches for surveys of employees, employers, EAPs, health promotion programs and related topics. We included websites, published literature, surveys, and other reports. We found our best evidence in 15 recent surveys, all completed in the last decade (Abraham & White, 2017; Adya, Cirka, & Mitchell, 2012; Attridge, 2012; Galinsky, Bond, & Sakai, 2008; Granberry et al., 2013; Lam et al., 2012; Macy et al., 2017; Matos & Galinsky, 2014; Mattke et al., 2013; McCleary et al., 2017; Prottas, Diamante, & Sandys, 2011; Rhodes, 2015; Rost et al., 2011; Spetch, Howland, & Lowman, 2011; Taranowski & Mahieu, 2013). Effectiveness of Work-Based Depression Programs. To determine the effectiveness of work-based depression programs, we conducted a comprehensive electronic search to identify evaluations of work-based intervention programs for depression using the following inclusion criteria: publication date of 2000 or later; focus on active employees with depression or depressive symptoms, interventions directed at the individual worker (i.e., no organizational interventions); intervention program offered in the workplace or with an employer-sponsored service, studies conducted in the United States or Canada; prospective studies with pre and post data (preferably with a control group); and measured outcomes of depressive symptoms and work. Our electronic searches encompassed PubMed (1,284), EBSCOHost (513), SCOPUS (687), SAGE Journals (210), and ProQuest (269). The combined reference list (with duplicates) contained 2,963 papers. One reviewer conducted an initial screen of all 2,963 references, determining relevance based on article title and abstract. This initial screen eliminated over 90% of the references. As a reliability check, two coders independently screened 100 PubMed publication titles for relevance. The coders agreed on 13 hits and 84 discarded references, with three references discarded by one coder but not the other. Two of the three disagreements were explained by one coder's familiarity with the papers. Based on this reliability check, we concluded that using a single coder for the title and abstract screen was satisfactory. The title and abstract screen yielded 251 references. After removing duplicate references, 192 articles remained. Our team screened the remaining 192 articles for various inclusion/exclusion criteria, the relevancy of the article to our research questions, and other factors. One reviewer examined the full texts of these publications and found eight articles for inclusion, of which five were controlled studies and three were single-group, pre-post studies. The PRISMA diagram shown in Figure 1 depicts each stage of our search. In June and July of 2017, we identified a convenience sample of 29 key informants in one of three groups: service providers/provider organizations, employers (purchasers) or consultants to employers, and insurance carriers. We chose informants based on their extensive experience and knowledge regarding work-based depression programs, including leaders responsible for developing innovative programs. We contacted these individuals by email and conducted interviews with consenting participants (others did not respond or were unavailable) from 17 organizations. Sixteen of these interviews were conducted with a single informant. One interview included two informants. The interviews consisted of included experts representing six provider organizations, eight employers, and four insurers, as shown in Table 1. The employer representatives were in private sector industries including finance, energy, manufacturing, information, transportation and health care. One person represented a coalition of employers from different industries and both the public and private sectors. Several of the employers were global companies. The provider representatives were affiliated with organizations including EAPs, digital health and telephonic counseling services and professional associations with a significant focus on workplace mental health. The four insurance industry representatives covered large insurer behavioral health plans, disability insurance and an integrated plan/health care system. * All potential participants received an introductory email and follow-up phone call. How widespread are work-based interventions for depression for employees, and what are their characteristics? Why are programs in place (who initiated and why), and what parties are involved in offering these programs (e.g., health plans, employers, EAPs, and/or national organizations)? What kinds of work-based intervention programs for depression are used and under what circumstances? What are the main attributes of successful programs? Throughout these interviews, respondents suggested factors that increased effective work-based depression care. After reviewing transcripts of recorded interviews, we organized specific quotes illustrating main ideas according to the sector represented and major themes. Further reviews grouped responses according to overlapping or similar content and distinct (non-overlapping) content. Specific quotes below illustrate key points. The findings are organized into five sections: types of work-based depression programs, effectiveness of work-based depression programs, innovative depression programs, strategies to improve depression treatment, and an integrative model. This first and fourth sections draw on both the environmental scan and key informant interviews, while the second section is based solely on the environmental scan and the third on the key informant interviews. The fifth section seeks to draw synthesize our findings into a single conceptual model. Through the environmental scan and key informant interviews we found four types of work-based depression programs. Our typology excludes private-pay treatments that occur outside of the workplace without any formal contractual relationship with the employer. Our summary includes both survey findings from the environmental scan and the informant interviews. Employee Assistance Programs. The most common form of work-based depression program is the EAP. EAPs generally offer assessment and short-term counseling (typically up to six sessions) for mild to moderate depression. Employees with more severe depression or long-term treatment needs are referred elsewhere for treatment. The counseling is usually provided telephonically. The quality of services is highly variable. EAPs can be either internal (paid staff of the organization) or external (services contracted to an outside vendor). Externally owned and operated EAPs are the dominant form in the employer market, though internal EAPs and hybrid models are more common among large, self-insured employers and employers in industries governed by federal safety regulations. According to one participant in a regulated industry, preference for internal EAP personnel assumes the importance of having specific knowledge of the industry, the work employees perform, and regulatory requirements. External EAPs typically are offered to employers through their health insurance carrier or an independent EAP vendor. Some external EAPs may have contracted personnel located at the worksite, but most are off-site and larger ones serve multiple customers. Off-site EAP personnel may work out of a centralized location, such as a call center, or from a home or an office. In internal EAP models, EAP personnel work for the same employer as their employee clients, usually with some personnel and services located at the worksite and some working remotely. The EAP market is highly competitive with multiple vendors vying to sell their EAP services. In this environment, the scope and quality of services is variable, reflecting both pricing pressures on EAPs as well as gaps in the purchaser's ability to evaluate the quality of EAP services. In many companies, the person responsible for managing the EAP, who could be a Vice President or manager of human resources (HR), employee benefits, or medical and health services, may have little direct knowledge of how to obtain the best quality from an EAP generally and specifically for depression care. In some companies, the account manager who works for the EAP vendor serves as the main source of information about which services to provide. Because business leaders making decisions about hiring EAP vendors may be ill-equipped to judge quality, EAP depression treatment rarely includes evidence-based care depression interventions such as workplace coaching to reduce the functional impact of depression on work performance. The number of employers offering EAP services grew steadily from 1998 through 2014. Between 1998 and 2008, access to EAPs increased from 70% to 76% for public sector employees and from 36% to 46% for private sector employees, according to the U.S. Bureau of Labor Statistics (Prottas et al., 2011). A 2008 national survey of EAP professionals reported 89% of large employers (500+ staff), 76% of medium-sized employers (100-499 staff) and 52% of small employers (1-99 staff) offered EAP services (Attridge, 2012). A 2014 survey based on a nationally representative sample of 1,051 employers with 50 or more employees (Matos & Galinsky, 2014) estimated that 95% of private sector organizations with more than 1,000 employees provided EAPs compared to 72% of companies with 50-99 employees. EAPs are neither standardized nor uniform in their services, but several national organizations, such as Employee Assistance Professionals Association, hold conferences, collect national data, and produce guidelines. Some EAPs ensure their counselors are certified as Certified Employee Assistance Professionals (CEAP) through the International Employee Assistance Professional Association, but they are in the minority (Granberry et al., 2013). Moreover, this certification addresses general competency in counseling, not specific mental health conditions. EAP adherence to evidence-based treatments is often weak. EAP utilization rates vary widely according to location and mission of the EAP. According to Attridge (2012), the most professional and most effective EAPs are those located on-site, fully integrated into the organization, and staffed by certified EAP counselors. He estimates that 10%-20% of employees use such programs annually. At the other extreme are external EAPs that provide services as part of a benefits package to employees that be used by as few as 1% of the company's workforce. Work-Based Health Promotion Programs. Another common intervention is health promotion or wellness programs. In its Healthy People 2010 initiative, the U.S. Department of Health and Human Services identified five elements for comprehensive workplace health promotion and wellness programs (McCleary et al., 2017): health education, supportive social and physical environment for healthy behavior supported by policy, integration of health promotion into organization's structure, linkage to related programs such as EAPs, and workplace screen linked to medical care with follow-up. Workplace health promotion programs typically focus on biometric and lifestyle risk factors such as smoking, alcohol misuse, unhealthy eating habits, and sedentary behavior. They may offer employees (and sometimes their dependents) financial incentives for healthy behaviors such as exercise or smoking cessation. They may offer on-site and/or online screening, health promotion, and/or health management services. That is, they attempt to screen people for health risks, prevent disease occurrence, and intervene early in the course of disease progression. Some provide stress management training as well as health education regarding depression. A systematic review classified wellness interventions into health assessments, lifestyle management, and behavioral health (Kaspin, Gorman, & Miller, 2013). About 94% of companies with more than 200 employees offer workplace wellness/health promotion programs (McLellan, 2017). Some programs screen for depression and, in the event of a positive screening result, may make referrals to an EAP or another care source, but depression is not a priority in these screenings. Only about 5.5% of employees receive screening for depression in health promotion programs (Mattke et al., 2013). This screening could well promote early intervention for depression if closely integrated with evidence-based depression treatments, but most organizations lack this integration. Disease Management Programs. Disease management refers to "reducing health care costs and improving quality of life for individuals with chronic conditions" (Academy of Managed Care Pharmacy, 2017). Managed care organizations and others have developed modules to systematically treat various chronic illnesses, such as diabetes and coronary artery disease. Increasingly, these are integrated with case management programs, which are aimed at improving the health of individuals with complex, chronic health conditions (Philip & Miller, 2013). Unfortunately, although depression is often chronic and depression care management is a type of disease management, few employers offer long-term disease management specifically for depression. Absence and Disability Management Programs. Employers may offer absence benefits (such as paid and unpaid time off), mandated leave programs such as those provided under the Family Medical Leave Act provisions, short-term disability benefits, and/or long-term disability benefits. These services generally pertain to employees who are about to start a leave of absence (either planned or unplanned) or already on leave or absent from work, including employees who are filing a disability insurance claim, if coverage is available, as well as those already receiving benefits. Disability management aims to manage the care and claims of workers with illnesses or injuries that result in lost work time, including diminished work performance, absenteeism, delayed return-to-work, and health care utilization. The goal is early intervention and care coordination with medical providers and supervisors at the worksite, including work accommodations when they can accelerate return-to-work. In the United States, disability management programs provide coordination and make referrals but rarely screen, assess, or treat depression. These four types of programs sometimes overlap in terms of content (e.g., services provided) and structure (part of the same organization). For example, all are sometimes considered collectively as employee health management programs and have partly or fully integrated infrastructure (Damsker et al., 2015). Companies may offer EAPs through their work-based health promotion and wellness programs or vice versa. Many EAPs are hybrids of internal and external control. Insurance companies sometimes own EAPs and sell them to companies. Little standardization, uniformity, or rigorous research exists on any of these programs with respect to depression care. Overall Prevalence Rates for Work-Based Depression Treatment. In contrast to the surveys summarized above, one recent study focused specifically on employer depression services company-wide and not on a particular type of program (Macy et al., 2017). Based on a random sample of 1,200 workplaces in Kentucky, this survey offered a snapshot of the prevalence of depression services across employers within one state. The researchers conducted a one-time, cross-sectional assessment examining work-based offerings of screening, education, counseling, management training, and health insurance coverage related to depression. Based on a sample of 167 respondents, 19% of employers offered clinical screening for depression, 21% offered self-assessment for depression (paper or online), 28% provided educational materials about depression (brochures, videos, posters, newsletters, online information), 23% provided individual or group counseling for depression, and 58% provided health insurance coverage for depression medication or mental health counseling. Thus, most worksites in Kentucky did not provide employee depression screening, education, counseling, management training on identifying warning signs of depression, or comprehensive treatment or follow-up for employees with depression. Smaller worksites (<250 employees) were the least likely to provide these services. As shown in Table 2, only five trials met our inclusion criteria, including four randomized controlled trials and one quasi-experimental study. The interventions included comprehensive programs, EAPs, and a mobile application for depression treatment. Comprehensive Program Evaluations. Wang et al. (2007) evaluated a telephone screening, outreach, and care management program offered to workers provided through a managed behavioral health care organization. The telephone screening included a brief self-report depression scale. Employees screening positive for depression were offered brief psychotherapy and antidepressants. Participants in the psychotherapy intervention received a psychoeducational workbook and in-person counseling (those who were reluctant could choose telephonic counseling). The psychotherapy included elements of CBT and motivational interviewing. A psychiatrist provided medication management. The control group received feedback and a recommendation to seek treatment, but no additional services. Several measures of depression and work outcomes at different times were significant, but the effect sizes were consistently small. In a series of three studies (including two randomized controlled trials), Lerner and colleagues (Lerner et al., 2012; Lerner et al., 2010; Lerner et al., 2015b) evaluated Be Well At Work (BWAW), a comprehensive, work-based intervention consisting of a depression-counseling intervention in eight telephone sessions over 4 months. BWAW included three integrated modules to promote symptom reduction and effective work functioning: (a) care coordination, including psychoeducation and motivational activation, to ensure alignment of treatment goals among the employee, the regular provider (usually a primary care provider [PCP]), and the BWAW counselor; (b) work-focused CBT strategies to reduce maladaptive thoughts, feelings, and behaviors; and (c) work coaching and modification strategies addressing work behaviors, work routines and characteristics of the work environment that are barriers to functioning. The findings were strong and consistently positive for both depression and work outcomes, yielding medium to large effect sizes in the two randomized trials (Lerner et al., 2012; Lerner et al., 2015b), as shown in Table 2. A subanalysis of the 2015 study showed positive outcomes for the subgroup of employees with dysthymia as well (Adler et al., 2015). Two replication studies are underway or nearly completed. Employee Assistance Program Evaluations. Three studies have evaluated the effectiveness of EAP services. Richmond and colleagues conducted two studies of an EAP program serving state government employees in Colorado. Participants included employees with a range of problems, but the studies reported outcome for the subgroup with depression. The first study was a one-group pre-post study (Richmond et al., 2014) and the second used a quasi-experimental design with propensity score matching (Richmond et al., 2015, 2016). They drew participants from a group of self-referrals to an EAP, unlike the preceding two studies in which the results of the depression screen determined invitation to participate. The EAP intervention included counseling and referral for medication management. In essence, this study examined EAP services under real-world conditions. A third study was a one-group pre-post evaluation in Canada of a telephone-administered CBT program provided through an EAP (Lam et al., 2011). All three studies found that the EAP intervention decreased depression symptoms and improved work functioning, but the effect sizes were small, as shown in Table 2. TABLE 2. Controlled Studies of Work-Focused Interventions for Depression Conducted in U.S.
E = experiment; C = control. Cognitive-Behavioral Therapy App. One randomized controlled trial examined the effectiveness of a mobile app providing CBT for depression to workers (Birney et al., 2016). Recruitment of participants was via the Internet, and the intervention included only the mobile app. The study yielded no significant results for the full worker sample. Studies of various mobile apps for people (not specifically workers) with depression have, however, often been positive for people with high levels of depression (Cuijpers et al., 2011). For example, a recent controlled trial comparing computer-assisted CBT blending Internet-delivered, skill-building modules with an average of 5 hours of therapeutic contact was equally effective as conventional face-to-face CBT for clients with major depressive disorders (Thase et al., 2017). We supplemented our review of the work-based depression program literature with studies of depression treatment outside the workplace, keeping in mind that EAPs often refer workers with depression who require more than brief counseling. United States studies have examined employment outcomes for depression treatment provided without any direct relationship to the workplace or the employer. Several studies of collaborative care for depression in primary care settings have included subgroup analyses of employed participants and reported significantly positive results for both depression and workplace outcomes (Rost, Smith, & Dickinson, 2004; Schoenbaum et al., 2002; Shippee et al., 2013; Smith et al., 2002; Wells et al., 2000). Collaborative care is considered an evidence-based treatment for depression based on robust evidence from 37 randomized controlled trials within primary care settings (Gilbody et al., 2006). The overall effect sizes are small, however, for depression outcomes improvement at 6 months and for follow-up periods of up to 5 years (Gilbody et al., 2006). Screening (Lerner et al., 2012; Lerner et al. 2015a; Wang et al., 2007). In the workplace, the first step in effective depression care is identification. Early identification makes early intervention possible, which leads to more rapid and complete recovery (Dewa et al., 2003; Franche et al., 2005; Hultin, Lindholm, & Möller, 2012; Kupfer, Frank, & Perel, 1989). Psychoeducation (Lerner et al., 2012; Lerner et al., 2015a; Wang et al., 2007). Psychoeducation empowers employees by reducing stigma and providing a rationale for treatment and increasing awareness of treatment options. Antidepressants (Trivedi et al., 2013). For employees who do not respond to brief counseling and other interventions, medications may be indicated. Psychopharmacology is an evidence-based treatment for major depressive disorders and should be offered to employee seeking help for depression, although 75% of people with depression prefer psychotherapy to psychopharmacology (McHugh et al., 2013). Work-Focused Cognitive-Behavioral Therapy (Lerner et al., 2012; Lerner et al., 2015a). CBT and cognitive therapy (a closely related model) are established treatments for depression (Hollon, 2016). Tailoring the intervention to the work environment makes sense for this population, and the evidence supports this adaptation. A recent and comprehensive systematic review of the international literature on workplace interventions for return-to-work identified two randomized controlled trials of work-focused CBT for workers with mental health conditions, with moderate to strong effects for reduced time lost from work, improved work functioning, and costs (Cullen et al., 2017). Conversely, Cullen et al. (2017) found no influence in seven randomized controlled trials for general CBT on time lost from work. Care Management (Lerner et al., 2012; Lerner et al., 2015a; Shippee et al., 2013; Wang et al., 2007). Time-limited counseling (such as offered by EAPs) is often not adequate, and some employees need coordination of care, including self-management strategies, and follow-up to achieve maximal benefit. Work Coaching and Modification (Lerner et al., 2012; Lerner et al., 2015a). A key principle in the psychiatric rehabilitation literature is focusing on the specific environment where the individual is seeking help (Corrigan et al., 2008). In a systematic review, Nieuwenhuijsen et al. (2013) identified"work-directed interventions" (e.g., ..."modifying the job task, or (temporarily) reduce the working hours") as a key ingredient of return-to-work programs for depression. A large prospective study in Canada found that companies that implemented a worker's requested (formal) workplace accommodations for mental health problems reduced depression over a one-year period (Bolo et al., 2013). Engagement. One core element common to all evidence-based practices in community mental health is engagement (Rössler & Drake, 2017). Given the low utilization rates for workers, even when employers provide exemplary depression services, work-based depression programs also need engagement strategies. Wang et al. (2007) identified outreach as a critical component of their model. Engagement includes active outreach to employees who screen positive for depression. Another familiar engagement strategy is motivational interviewing (Miller & Rollnick, 2002), which has been incorporated into work-based depression treatment models (Wang et al., 2007). Integration/Coordination with Prescribers and Other Providers. Another element in many depression treatment programs, notably in settings where none of the staff are prescribers, is integration/coordination with prescribers and other providers. When treatment involves multiple providers, integration is critical (Corrigan et al., 2008). Measurement-Based Care. Another critical element of evidence-based depression treatment is measurement-based care (Fortney et al., 2015; Rush, 2015). Stated simply, this means that clinicians and employees track depression symptoms and work performance longitudinally to identify people who are not improving and formulate evidence-based next steps. Shared Decision-Making. Finally, the evidence-based principle of shared decision-making is well established in medicine. It has been defined as "an approach where clinicians and patients share the best available evidence when faced with the task of making decisions, and where patients are supported to consider options, to achieve informed preferences" (Elwyn et al., 2012). Shared decision-making increases satisfaction with services, treatment adherence, and ultimately treatment effectiveness. Key informants identified many barriers to ensuring effective work-based depression programs, including stigma, inadequate supply of adequately trained providers, lack of coordination among programs and providers, and costs of care. Conversely, they noted several innovative approaches to depression treatment, as described below. Employee Assistance Program Innovations. Several EAP providers have adopted programs to educate people in the workplace about mental health and mental illness through anti-stigma campaigns. Some EAP providers have manager training aimed at improving awareness of mental health issues. One EAP described a "total health" campaign to ensure that employees felt they could, without repercussions, safely and confidentially get care for depression. To increase integration, some EAP directors consult with other in-house or contracted service vendors (e.g., occupational health nurses) to manage the care of employees with complex, high-risk, health problems (e.g., fitness for duty issues, employees requesting medical leave, etc.). One informant noted, "Innovative EAPs, which are rare, can serve as a bridge between the workplace and community-based resources. At their best, EAPs can be internal consultants on mental health issues in the workplace, interacting with management, HR, benefits leaders, etc., to address issues such as layoffs. They also can provide high-quality counseling, which for clinical depression includes both psychotherapy and medical or psychiatric care." Innovations in Physician Payment and Delivery. Employers, purchasing coalitions, insurance carriers, and provider networks have taken steps to improve the quality of primary care for depression, overcome psychiatrist shortages, and improve access to behavioral health care. Insurance coverage limits constitute one barrier to implementing collaborative care in primary care settings, because some components are not reimbursed. To remediated this obstacle, one group of employers joined together to institute changes in their insurance coverage to align diagnostic and procedure codes with the collaborative care model. In most settings, however, opening new codes requires employers to negotiate with their insurance carriers or third-party administrators. Copayments for covered behavioral health care are another barrier. Some employers have reduced employee co-payments for psychiatric visits (typically set at the higher specialist co-payment rate) to the co-payment rate for primary care. Other innovations include online video chatting, telehealth in rural areas, and providing online resources and tools to increase access to evidence-based depression treatment. People with a variety of illnesses do poorly when comorbid depression occurs. In disease management programs, case management can proactively identify individuals with complex and/or costly health problems, determine if there is diagnosed or undiagnosed mental comorbidity, and arrange for behavioral health care to become part of the patient's care (Philip & Miller, 2013). One informant described replacing the usual "diagnosis-specific" focus of care, treating one illness at a time, with a more realistic approach to complex illnesses. He noted that "employers are getting more interested in getting the right care to the people who need higher levels of care such as those with complex medical and behavioral conditions." In other words, employees with comorbid depression may have a complicated, high-cost, high-utilization condition. Case management attempts to coordinate and sometimes supplement the care. Finally, some informants discussed employers' growing interest in "value-based purchasing," a reimbursement system that pays on the basis of improved patient outcomes, rather than volume of medical treatment (VanLare & Conway, 2012). These concepts are gaining support as a mechanism for helping employees to find high-performing, high-value providers. For example, several informants mentioned that employers want PCPs in their networks certified as medical homes. As one informant put it, employers are using value-based purchasing to "drive changes in primary care." Innovations in Health Promotion Programs. A hallmark of evidence-based medicine is incorporating patient preferences into treatment plans and offering options, recognizing wide variation in the preferred treatment modality for a given individual. Accordingly, one company has sought to maximize depression treatment options. Based on a well-being survey, employees with depression symptoms are given choices in their referral to one or more of the following: EAP counseling, on-site health promotion centers staffed by personnel trained to recognize depression and offering on-site psychologists, employee benefits, virtual access to providers, community-based networks of providers, an online rating system of providers, peer support groups, and a corporate medical director. In this company, on-site and online resources are crucial because of employees work odd schedules and long work hours. Another company has a corporate stress and resiliency strategy with three foci: reducing the root causes of stress; improving coping and responses to stressors (using positive psychology approaches such as mindfulness, energy management, and practicing appreciation); and problem-focused, crisis-response and rehabilitation interventions. The stress and resiliency program is part of an overall goal to achieve optimal emotional, mental, and social well-being for all employees. The company has on-site health clinics, an EAP vendor, care managers, and other resources. The care managers serve as advocates for employees, usually with high-acuity illnesses, to help them find the most appropriate care. This company also has a sophisticated assessment system including the use of the standardized depression scales (e.g., the PHQ-2 and PHQ-9) in their on-site clinics. The company's health risk assessment includes the Pressure Management Indicator (PMI), the results of which are reviewed with a staff health professional. This process can trigger additional assessments and referrals for employees identified as having a problem on the PMI or through subsequent discussions with a health professional at an on-site health center. Another survey includes a workplace stress questionnaire called the Team Agility Index, which assesses stress on an individual or work group. Work groups that score high on stress are assigned a skilled facilitator (an EAP counselor), who supports the group in efforts to test modifications. At this site, all managers participate in health training to understand the importance of health in the work environment and attention to cultural and environmental elements impacting health. The training includes a unit on depression. One informant expressed this underlying rationale for this approach best. "I have a philosophical position that the context matters. A context of whether or not this is done within a comprehensive program on health and the whole environment within which a depression program might be managed matters. You know, you can buy some off the shelf...depression education and screening program right here...and it's sort of an isolated entity. It may or may not be in the context of an environment where there's a heavy emphasis on health in general and there's a comprehensive screening and intake process and all of this." Innovations in Absence and Disability Management. In some companies, vendors and consultants provide data analysis services, reviewing disability claims, absence records, and other sources to help employers target costly problems that may require specific attention. One informant, who frequently consults with employers, indicated that the initial discussion with employers is around "pain points," such as lost work time, and medical and disability claims costs. Employers are sometime surprised to learn that depression is a major contributing factor. One company has consolidated the management of its outsourced service vendors including those providing services in the areas of disability management, Worker's Compensation, EAP, absence management, life insurance, family medical leave, and Americans with Disabilities Act (ADA) compliance. Centralized vendor management makes it easier to track employee health problems across different programs and coordinate efforts to address these problems. This company's disability management program provides vocational rehabilitation counseling services with an emphasis on stay-at-work and return-to-work programs, using a Functional Capacity Evaluation assessment tool. The assessment helps to create employee accommodation plans and monitor progress. Incorporate a behavioral health assessment when an employee requests a leave of absence. Once an employee is on leave, the group managing the claim -- either a third-party administrator or insurance carrier, should involve claims examiners with behavioral health expertise to ensure that the employee is getting appropriate care. Have professionals on site in the workplace to interact with claims examiners and/or providers to create a feasible return-to-work plan, including accommodations. Review employer-sponsored long-term disability insurance, which typically limit coverage for mental disorders to 2 years, and follow up with advocacy for changes to be more responsive to employee circumstances. Train front-line managers about how to recognize and respond to an employee who may be depressed, and the requirements under the ADA. In addition to the innovative programs described above, informants noted a number of company-wide strategies to promote better depression services. While most employers had not yet fully adopted these strategies, informants suggested that initial efforts were promising. Using Data and Analytics. Employers want a healthy, productive workforce, minimal absenteeism, and efficient health care utilization. And they want to accomplish these goals using data on costs and outcomes and, in some cases, those responsible for making recommendations about programs and strategies are required to make a business case for these. Return on investment analyses is one approach to making the business case. In other words, programs need to measure depression, program costs and outcomes which may include work performance and absenteeism. Reliance on medical and pharmacy claims data is high and many companies lack the resources necessary to perform a more comprehensive analysis. Claims data rarely provide sufficient insight into the prevalence and costs of depression and outcomes. Some employers systematically collect and monitor standardized assessment of depression screening, depression symptoms, and workplace performance, including population-based assessments. Some also track costs across different departments: absenteeism, employee assessment programs, pharmacy, and insurance. Some employers systematically collect and monitor standardized assessment of depression screening, depression symptoms, and workplace performance, including population-based assessments. Instruments such as the PHQ-9 are available and provide important information. Assessments of work performance using the Work Limitations Questionnaire or Health and Performance Questionnaire also provide high-quality targeted information. Some track costs across different departments: absenteeism, employee assessment programs, pharmacy, and insurance. However, persisting barriers include insufficient data availability and quality, the high costs of collecting, accessing and analyzing data, poor data integration across company silos and vendors, lack of standardization within companies and more generally, and lack of adequate benchmarks. Many companies lack the expertise, time and resources to collect and analyze data. Providing technical assistance could increase recognition of the prevalence and costs of depression and stimulate action. Integrating Services and Vendors. One common problem in large companies is fragmentation of services. One person or group monitors job performance, another health-screening, another EAP use, another psychiatric care, another medical care, another disability management, and so on. These groups may never compare notes or try to integrate care. One nurse cited an example of a depressed employee whose performance continued to deteriorate, even after referral and treatment with an antidepressant, because he had been misdiagnosed. He had never been checked for a common underlying condition, hypothyroidism, which causes depression, low energy, and drowsiness. Integrating various sources of care results in better care, health, and work performance, but is difficult in the current fragmented United States health and insurance systems, with their complex rules that prevent sharing of information. Changing the Culture Regarding Mental Health. Because of the stigma of mental illness and misunderstandings about its origins, many work setting have avoided open and frank discussion of mental health issues. Thus, employers and employees rarely discuss depression. Similarly, EAPs have traditionally focused on substance abuse and other problems. The question has been, "How do we legitimize feelings of depression?" Experts identified three approaches to combatting stigma. The first approach has been to offer educational programs that include but do not name depression, because, as one respondent stated, "in the workplace people don't go to programs about depression." For example, some programs use alternative terminology such as "Right Direction for Me" or they emphasize health more broadly and include depression as one topic. A second approach has been to name depression directly and model openness by discussions at all levels. Programs called "RU OK" and "Suicide Stand Down" use this approach. One expert argued that, ultimately, changing the workplace culture requires brave and visionary leadership. A third strategy for changing the workplace culture is to educate managers and supervisors regarding mental health issues. A recent Australian randomized controlled trial examined the impact of manager training can have on reducing absenteeism (Milligan-Saville et al., 2017). The study randomly assigned 128 duty commander managers in an urban fire service to participate in a four-hour face-to-face mental health training program that focused on recognizing and addressing symptoms of depression and other mental health issues in the workplace. The training addressed management roles in employee mental health and the development of skills for discussing mental health. The study examined changes 6 months after the training in sickness absences among the 2,000 firefighters and station officers supervised by the study participants. Workers supervised by managers receiving the training decreased work-related sick leave by an estimated 6.5 hours per employee over the 6-month period, compared to an increase in the control group. The authors estimated a 10:1 return on investment for the training. Changing Policies. Beyond changing attitudes and culture, companies need to adopt policies that make evidence-based depression care more accessible and likely. Several such policies exist: discouraging high-deductible insurance policies, creating service codes and incentives for the collaborative care model of depression, and establishing contracts for value-based care and a population health focus. As one respondent expressed, employers who adopt these policies "all of a sudden care very much about mental health because they understand how much it affects physical health." Incorporating Work Assessment and Work-Focused Interventions into Depression Care. Clinicians who treat depression often ignore the specific context of the work environment. Several respondents criticized EAPs for losing touch with the workplace as more counselors work off-site and do not obtain specific training in work assessment and work counseling, such as the CEAP certification. This type of focus is rare in medical care settings and usually occurs when a person is thinking about giving up on work. Understanding the work environment should naturally lead to a better understanding how to help employees with depression maintain their ability to work. As one informant put it, we should not "wait until people go out on leave and then accommodate them when they are coming back." Strategies to Increase Adoption of Employer-Sponsored Evidence-Based Depression Services. In many companies, administrators responsible for choosing vendors to provide EAP services, health and wellness programs, and other depression services has little awareness of the scientific research on effectiveness and cost-benefit. Consequently, it would seem a reasonable strategy to find methods to educate and ultimately influence these decision-makers and those who advise them. While there are many websites and resource materials to help companies decide which depression programs to offer employees and which vendors to hire, key decision-makers are unaware of these resources, assume that they do not apply to their business, or otherwise are not influenced by them. It is also possible that decision-makers do not see the need to change existing services. In one study, interviews with employers, health insurance carriers, and behavioral health care providers found that the decision-makers who were the purchasers of depression services were generally did not prioritize improving depression care and consequently insurers and providers showed little interest in improving care in the absence of purchaser demand. Employers typically purchased workplace depression services that were inexpensive, with little to their evidence base (Rost et al., 2011). The failure of resource materials that provide scientific information to influence employers' decision-making is not surprising; studies have consistently documented the failure of "passive diffusion" to change policy (Shojania & Grimshaw, 2005). Even a direct approach of inviting employers to a presentation explaining the scientific evidence supporting evidence-based depression treatment has not been effective (Rost, Marshall, & Xu, 2014). Within community mental health a more effective strategy for influencing decisions to adopt and implement evidence-based treatment has been a "learning community" approach emphasizing participant involvement and collaboration in decision-making and ongoing outcome monitoring and sharing of data (Becker, Drake, & Bond, 2014). In this final section, we synthesize the findings into a single model, as shown in Figure 2. Work-based depression care involves a continuum of depression care that should be managed by a designated depression care coordinator. This role would not be a new position or office within the organization, but an area of responsibility for an existing staff person or office. In some organizations, this might be the health care coordinator, in other companies, the EAP director or other EAP counselor might serve in this role; in other organizations, the coordination occurs in other units within the company, according to the key informant interview. Because depression is a complex disorder manifesting in different symptoms and levels of severity, and because of the many programs involved in depression care, fragmentation of services and poor communication are common. Unless a company has a designated depression care coordinator role, the company will not achieve adequate coordination among different programs. The depression care coordinator ensures communication, coordination, referral, and follow-up among the various programs that address depression, including primary care and specialty care providers external to the organization. The coordinator should aim at embedding evidence-based services in existing programs and departments rather than creating new stand-alone depression programs. Work-based depression care requires attention to three levels: in the workplace (organizational interventions), in employer-based programs (including health promotion programs, EAPs, disease management programs, and disability management programs), and outside the workplace (in primary care and specialty care). Quality improvement based on data collection and monitoring should occur at all levels, to facilitate with planning and decision-making. Level One: Organizational interventions in the workplace include establishing a culture of health, anti-stigma campaigns, manager training, and alignment of agency policies (such as insurance benefits) to promote a supportive work environment. Organizational interventions also include other strategies that prevent depression, such as light exposure, steady work shifts, and exercise. Some of these strategies have been researched, though the evidence base could be strengthened. The general finding is that organizational factors (good-quality supervision and employee-friendly workplace conditions) affect the mental health and well-being of the workforce (Modini et al., 2016). Employers should be encouraged to experiment with different approaches to promoting a supportive work environment. Managing the work environment to prevent depression parallels the well-researched evidence base used by companies in creating and maintaining a safe work environment to prevent injury. Employer-sponsored depression services include health promotion and depression prevention activities, which may be incorporated into a broader set of organizational interventions, or offered separately, for example, as a health promotion program managed by the employer's health insurance. One key element is screening for depression (typically as part of a larger biometric screening). Employee participation is typically low in most organizations, so methods for encouraging employees to participate are needed if the full benefits of screening are to be realized. Screening by itself is not sufficient, of course. Employees who screen positive for being at risk for depression or currently experiencing depressive symptoms should receive feedback and offers for referral to appropriate level of care. The referral process appears to be inadequate in many companies; changing the workplace culture may be the key to increasing employee utilization of work-based depression services. These services should be embedded in existing programs. Prevention interventions include options such as stress management groups, exercise groups and competitions, and the many other options that studies have suggested may be instrumental in reducing stress and preventing the development of more serious depressive symptoms. Level Two: Evidence-based, work-based depression care is a second component of employer-sponsored depression services. A comprehensive workplace depression care continuum should include the BWAW program or another evidence-based program for employees with depressive symptoms. These evidence-based interventions will concurrently address symptoms and functioning at work. Two other employer-based programs have important roles in the continuum of depression care: Disease management programs should assess for depression all employees referred to this unit for chronic illnesses and make appropriate referrals (e.g., to the EAP program). In theory, disease management programs could offer depression management, but in practice, it appears that few do. Disability management programs for employees on a leave of absence for depression should include outreach, education, and referral. Employees should be encouraged to return to work with possible accommodations, and they should be educated on effective interventions as well as the personal costs and benefits of applying for SSDI versus continuing to work. Level Three: The continuum of depression care must include the network of outside providers, such as PCPs, psychiatrists, and other mental health providers. Health insurance coverage should mandate evidence-based depression care, including collaborative care. The depression care coordinator must identify community providers who offer evidence-based depression treatment. Work-based health interventions are ubiquitous in large United States companies and common in middle-sized companies. Four types of programs (EAPs, health and wellness promotion, disease management, and disability management) could potentially serve workers with depression, but only EAPs commonly do so, and only by offering brief, non-medical counseling for workers with mild to moderate depression. While some EAPs offer excellent services, in other cases EAPs and their counselors are neither standardized nor accredited. A small number of rigorous evaluations have shown that EAPs were helpful to depressed workers, but the effect sizes were small. More promising interventions -- comprehensive depression treatment programs offered by research teams outside of usual EAP and health promotion programs -- have produced medium to large effects, not only on decreasing depression but also on improving work function. But these interventions have not yet been asserted into real-world conditions (i.e., large-scale implementations using usual providers and treating heterogeneous employees). The rigorous research in the United States on work-focused interventions for depression consists of a small number of controlled trials. International research, including studies of return-to-work programs for workers on sickness leave for depression has identified a number of effective program elements. These non-United States studies may generalize to the United States, but research must evaluate applicability in the United States. Combining the United States and international literatures, we identified components of effective work-based depression programs: screening, referral, psychoeducation, care management, counseling, medication, and work-focused interventions. The most promising of the approaches reported in the United States literature is Be Well At Work, a comprehensive, standardized program with positive results in two controlled trials. BWAW is initiated at the population-level with a web-assisted, privacy-protected, health-screening tool, available in the workplace; all participants receive immediate, personalized results and recommendations; and workers screening positive for depression can access a telephone-based intervention with follow-up. BWAW reduces depression, improves work performance, and decreases absenteeism. Our review identified international reviews identifying programs promote return-to-work among depressed workers (Nieuwenhuijsen et al., 2014), work-based interventions for common mental disorders (Joyce et al., 2016), managing depression and anxiety at work (Bhui et al., 2012), and population-based interventions aimed at preventing depression through stress management in the workplace (Tan et al. 2014). Although both the United States and international literatures have identified components of effective work-based programs, measures of quality, such as fidelity scales (Bond et al., 2000), are missing and need development. To persuade employers, insurers, government agencies, and other stakeholders of the need for depression treatment, cost studies must evaluate return on investment. Employees experiencing depression are at risk for leaving the workforce and applying for disability benefits, including SSDI. No published studies have as yet examined the impact of work-based depression treatment on SSDI. In the United States, several disability management demonstration projects in the 1990s and early 2000s showed cost savings to employers by reducing absences from the job through medical care, rehabilitation, and job accommodations (Hunt, 2009; Skisak, Bhojani, & Tsai, 2006). Few of these demonstrations explicitly examined workers with depression, but one demonstration reported that increasing medication adherence reduced absence from work for employees on short-term disability for depression (Burton et al., 2007). Employees who did not adhere with acute treatment were 38.7% more likely to have short-term disability claims than adherent employees. Early intervention to address depression promises to help workers maintain employment. From a policy standpoint, a large national trial of a comprehensive model incorporating evidence-based principles and sampling across different occupational groups and different-sized companies could inform disability policy if the follow-up period were sufficient to assess applications for SSDI. 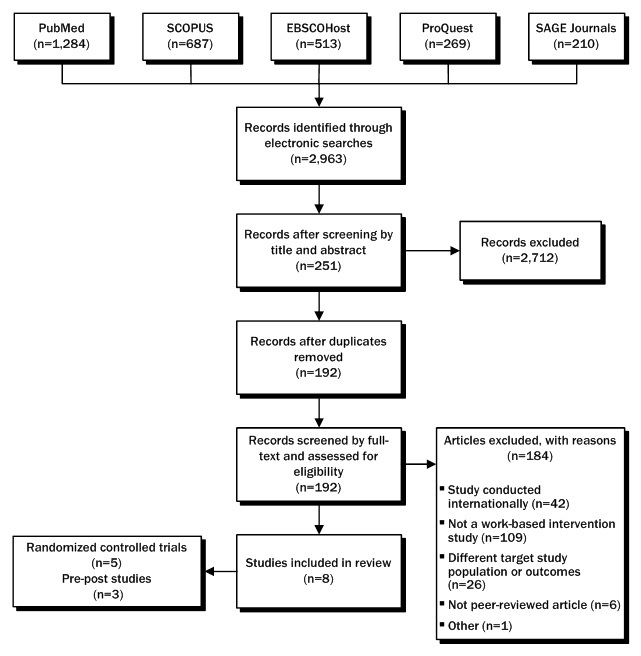 Information on real-world, work-based, depression treatment exists mostly in the gray literature; it is fragmented and generally of low research quality. Surveys of health promotion programs, EAPs, and disability management programs, provide an incomplete picture because depression treatment was not their focus. Most studies had serious methodological limitations, including unrepresentative samples, low response rates, and brief instruments. The surveys typically examined a particular type of program (e.g., health promotion programs or EAPs) with minimal attention to depression treatment. Furthermore, existing surveys did not examine linkages between different programs, limiting our understanding of comprehensive services within any organization. Comprehensive surveys of employer-based depression treatment using rigorous survey methodologies and large representative samples could substantially inform policy. Depression in the workplace often goes untreated for many reasons. Employees may not identify symptoms correctly, may not be aware of available treatment options, and may be reluctant to seek help at the workplace because of the stigma. Employers rarely offer an integrated continuum of depression treatment, instead providing components in separate programs that do not work closely together. EAPs offer brief counseling limited usually to six or fewer sessions, which may be inadequate for many workers with depression. Insurance coverage for depression treatment in primary care often does not authorize coverage for collaborative care or other evidence-based practices. Key informant interviews identified several strategies for expanding work-based depression programs. For example, a proactive approach could integrate services and vendors (e.g., different vendors providing disability management and EAP services) and create helpful collaborations. Informants also stressed the importance of quantitative data (such as the results of depression screens, EAP utilization, and claims) on management decisions. We identified several areas needing further research, especially from the standpoint of formulating national policy. Needed studies include a conceptual framework for work-based depression programs, high-quality surveys, better data and analytic frameworks, studies of prevention, research on the integration of services and organizations, high-quality effectiveness trials (using real-world resources, implementation research, long-term follow-ups, and economic analyses). The rationale for work-based interventions for depressed workers is compelling: depression is usually a treatable condition, and untreated depression is common, causes personal suffering, and costs employers billions of dollars each year. The research on a small number of comprehensive interventions that address symptoms and workplace issues is promising. Thus far, however, the evidence on real-world EAPs and health promotion programs suggests minimal attention to depression, poor quality, and uncertain outcomes. Work-based interventions internationally are more robust, as are collaborative care interventions within primary care in the United States. For people with depression and their families, the interventions can save lives and improve function and quality of life. For employers, the interventions can reduce low productivity, absences, disability leave, and turnover. For clinicians and society, the interventions can increase the rate of detection and effective treatment. For government, the interventions can increase economic productivity and potentially prevent disability costs. Barriers to Implementation of Evidence-Based Treatments in the Workplace. Many factors account for widespread underuse and poor implementation of evidence-based treatment for depression (Wang, Simon, & Kessler, 2003). First, depression is often undetected, and employers may underinvest in work-based depression programs because they do not recognize the costs of depression (Stewart et al., 2003). Second, stigma associated with mental illness persists, inhibiting employees from seeking help and supervisors from referring distressed workers to health promotion services. Third, incentives for implementing high-quality depression treatment programs are misaligned. Small employers have neither the resources nor the expertise to provide adequate services. EAPs have been challenged by a business model that does not involve reimbursement and are often capitated, which discourages intensive services and incentivizes rapid assessment and referral. Fourth, in the interest of cutting costs, many businesses have decentralized depression screening and assessment services by relying on phone centers or home-based services, thereby reducing counselor skill level and familiarity with the employer's workplace. Fifth, business groups, instead of relying on scientific evidence and consulting with experts in depression treatment, have often relied on consulting firms marketing health promotion programs without firm grounding in scientific evidence. The keen interest in mobile applications for depression is a case in point: the products for treating depression are incipient, of uneven quality, and untested. Sixth, most health promotion programs have little or no adherence to evidence-based guidelines, do not monitor program outcomes through standardized measures, and rarely employ quality improvement procedures. Knowledge gaps regarding depression care and barriers in the workplace abound. Employers and experts have endeavored to increase awareness of these issues and address difficult problems, but minimal support for these efforts exists nationally. Collaborations among patient advocacy groups, public sector agencies, private employers, commercial entities, government, and researchers could facilitate progress. Without explicit efforts, however, decisions will continue to devolve to employers, who may not be accessing the best available information, and commercial vendors with vested interests in the marketplace. Assuming the emergence of functional collaborations, we offer several recommendations. First, high-quality surveys could improve the existing state of knowledge. Scientific surveys should address program types, implementation, components, service integration, quality assurance, client flow, short-term and long-term outcomes, and costs. Second, the field needs a conceptual framework for work-based depression programs, one that proposes useful components, coordination, metrics, information, feedback loops, and unbiased review. A current framework could be proposed but must be tested and improved by accurate data. Third, better analytic frameworks could improve learning, comparison across programs, and management. Businesses use these techniques, as do some health care networks. Together, they could create systems that would serve all parties. Fourth, employers have multifarious opportunities to prevent as well as treat depression, but few are assessing current initiatives scientifically. Health researchers could propose valid frameworks for studying environmental, social, and psychological interventions that could address depression as well as other stress-related disorders and problems. Fifth, because companies and health services comprise complex organizations, systems analysts could help design and understand innovations to enhance communication and integration. This process is relatively simple but needs scientific design and analysis. Sixth, the field of employment-based depression treatment needs more high-quality effectiveness studies (randomized controlled trials using real-world resources, long-term follow-up research, and economic analyses) to compare health, employment, cost, and disability outcomes. Finally, we repeat Louis Brandeis' dictum that "sunlight is the best antiseptic." Companies as well as other stakeholders need to commit to greater collaborative transparency, perhaps by creating a repository of accurate information, based on common metrics and templates, and disseminating the information broadly to businesses. If depression care in the workplace improves, employees, families, employers, insurers, government, and others will benefit. Abraham, J., & White, K.M. (2017). Tracking the changing landscape of corporate wellness companies. Health Affairs, 36, 222-228. Academy of Managed Care Pharmacy. (2017). Concept paper (http://www.amcp.org/WorkArea/DownloadAsset.aspx?id=9295). Adler, D.A., Lerner, D., Visco, Z.L., Greenhill, A., Chang, H., Cymerman, E., Azocar, F., & Rogers, W.H. (2015). Improving work outcomes of dysthymia (persistent depressive disorder) in an employed population. General Hospital Psychiatry, 37, 352-359. Adler, D.A., McLaughlin, T.J., Rogers, W.H., Chang, H., Lapitsky, L., & Lerner, D. (2006). Job performance deficits due to depression. American Journal of Psychiatry, 163, 1569-1576. Adya, M., Cirka, C., & Mitchell, K. (2012). Corporate return to work policies and practices: A national study. Burton Blatt Institute, Syracuse University (http://bbi.syr.edu/projects/Return_To_Work/docs/RTW_study_final_report.pdf). Arends, I., Bültmann, U., Nielsen, K., van Rhenen, W., de Boer, M.R., & van der Klink, J.J. (2014). Process evaluation of a problem solving intervention to prevent recurrent sickness absence in workers with common mental disorders. Social Science and Medicine, 100, 123-132. Attridge, M. (2008). A quiet crisis: The business case for managing employee mental health. Human Solutions Report. Attridge, M. (2012). Employee assistance programs: Evidence and current trends. In R.J. Gatchel & I.Z. Schultz (Eds. ), Handbook of occupational health and wellness (pp. 441-467). New York, NY: Springer. Becker, D.R., Drake, R.E., & Bond, G.R. (2014). The IPS supported employment learning collaborative. Psychiatric Rehabilitation Journal, 37, 79-85. Bhui, K.S., Dinos, S., Stansfeld, S.A., & White, P.D. (2012). A synthesis of the evidence for managing stress at work: a review of the reviews reporting on anxiety, depression, and absenteeism. Journal of Environmental and Public Health, 1-21. doi:10.1155/2012/515874 . Birnbaum, H.C., Kessler, R.C., Kelley, D., Ben-Hamadi, R., Joish, V.N., & Greenberg, P.E. (2010). Employer burden of mild, moderate, and severe major depressive disorder: Mental health services utilization and costs, and work performance. Depression and Anxiety, 27, 78-89. Birney, A.J., Gunn, R., Russell, J.K., & Ary, D.V. (2016). MoodHacker mobile web app with email for adults to self-manage mild-to-moderate depression: Randomized controlled trial. JMIR Mhealth Uhealth, 4(1), E8. Blustein, D.L. (2008). The role of work in psychological health and well-being: A conceptual, historical, and public policy perspective. American Psychologist, 63, 228-240. Bolo, C., Sareen, J., Patten, S., Schmitz, N., Currie, S., & Wang, J. (2013). Receiving workplace mental health accommodations and the outcome of mental disorders in employees with a depressive and/or anxiety disorder. Journal of Occupational and Environmental Medicine, 55, 1293-1299. Bond, G.R., Evans, L., Salyers, M.P., Williams, J., & Kim, H.K. (2000). Measurement of fidelity in psychiatric rehabilitation. Mental Health Services Research, 2, 75-87. Bültmann, U., Huibers, M.J., van Amelsvoort, L.P., Kant, I., Kasl, S.V., & Swaen, G.M. (2005). Psychological distress, fatigue and long-term sickness absence: Prospective results from the Maastricht Cohort Study. I, 47, 941-947. Burkhauser, R.V., & Daly, M.C. (2011). Lessons from Dutch disability policy reforms. In R.V. Burkhauser & M.C. Daly (Eds. ), The declining work and welfare of people with disabilities: What went wrong and a strategy for change(pp. 68-84). Washington, DC: American Enterprise Institute for Public Policy Research. Burton, W.N., Chen, C., Conti, D.J., Schultz, A.B., & Edington, D.W. (2007). The association of antidepressant medication adherence with employee disability absences. American Journal of Managed Care, 13, 105-112. Cimpean, D., & Drake, R.E. (2011). Treating co-morbid chronic medical conditions and anxiety/depression. Epidemiology and Psychiatric Sciences, 20, 141-150. Contreary, K., & Perez-Johnson, I. (2016). Behavioral interventions to promote job retention after injury or illness. Final report to U.S. Department of Labor. Washington, DC: Mathematica Policy Research. Corrigan, P.W., Mueser, K.T., Bond, G.R., Drake, R.E., & Solomon, P. (2008). Principles and practice of psychiatric rehabilitation: An empirical approach. New York, NY: Guilford Press. Cuijpers, P., Donker, T., Johansson, R., Mohr, D.C., van Straten, A., & Andersson, G. (2011). Self-guided psychological treatment for depressive symptoms: A meta-analysis. PLOS ONE, 6(6), e21274. Cullen, K.L., Irvin, E., Collie, A., Clay, F., Gensby, U., Jennings, P.A., Hogg-Johnson, S., Kristman, V., Laberge, M., McKenzie, D., Newnam, S., Palagyi, A., Ruseckaite, R., Sheppard, D.M., Shourie, S., Steenstra, I., Van Eerd, D., & Amick, B.C. III (2017). Effectiveness of workplace interventions in return-to-work for musculoskeletal, pain-related and mental health conditions: An update of the evidence and messages for practitioners.Journal of Occupational Rehabilitation. doi:10.1007/s10926-016-9690-x. Damsker, M., Connor, M., Framer, E.M., Umland, B., Anderson, D., Alexander, G., Brennan, M., Flynn, J., Grossmeier, J., Hamlin, B., Juster, I.A., Kaplan, G.D., Long, A., Nelson, C.F., Palma-Davis, L., Palmer, R., Srivastava, P., Veroff, D., Noyce, J., & Moseley, K. (2015). Program measurement and evaluation guide: Core metrics for employee health management. Health Enhancement Research Organization and Population Health Alliance (http://www.populationhealthalliance.org/). Dewa, C.S., Hoch, J.S., Lin, E., Paterson, M., & Goering, P. (2003). Patterns of antidepressant use and duration of depression related absence from work. British Journal of Psychiatry, 183, 507-513. Dewa, C.S., Thompson, A.H., & Jacobs, P. (2011). The association of treatment of depressive episodes and work productivity. Canadian Journal of Psychiatry, 56, 743-750. Drake, R.E., Bond, G.R., Goldman, H.H., Hogan, M.F., & Karakus, M. (2016). Individual placement and support services boost employment for people with serious mental illness, but funding is lacking. Health Affairs, 35, 1098-1105. Elwyn, G., Frosch, D., Thomson, R., Joseph-Williams, N., Lloyd, A., Kinnersley, P., Cording, E., Tomson, D., Dodd, C., Rollnick, S., Edwards, A., & Barry, M. (2012). Shared decision making: A model for clinical practice. Journal of General Internal Medicine, 27, 1361-1367. Evans, D.L., Charney, D.S., Lewis, L., Golden, R.N., Gorman, J.M., Krishnan, K.R., & Nemeroff, C.B., Bremner, J.D., Carney, R.M., Coyne, J.C., Delong, M.R., Frasure-Smith, N., Glassman, A.H., Gold, P.W., Grant, I., Gwyther, L., Ironson, G., Johnson, R.L., Kanner, A.M., Katon, W.J., Kaufmann, P.G., Keefe, F.J., Ketter, T., Laughren, T.P., Leserman, J., Lyketsos, C.G., McDonald, W.M., McEwen, B.S., Miller, A.H., Musselman, D., O'Connor, C., Petitto, J.M., Pollock, B.G., Robinson, R.G., Roose, S.P., Rowland, J., Sheline, Y., Sheps, D.S., Simon, G., Spiegel, D., Stunkard, A., Sunderland, T., Tibbits, P. Jr., & Valvo, W.J. (2005). Mood disorders in the medically ill: Scientific review and recommendations. Biological Psychiatry, 58, 175-189. Fortney, J., Sladek, R., Unützer, J., Kennedy, P., Harbin, H., Emmet, B., Alfred, L., & Carneal, G. (2015). Fixing behavioral health care in America: A national call for measurement-based care in the delivery of behavioral health services. Kennedy Forum (http://www.thekennedyforum.org/). Fournier, J.C., DeRubeis, R.J., Amsterdam, J., Shelton, R.C., & Hollon, S.D. (2015). Gains in employment status following antidepressant medication or cognitive therapy for depression.BJP, 206, 332-338. Franche, R., Cullen, K., Clarke, J., Irvin, E., Sinclair, S., & Frank, J. (2005). Workplace-based return-to-work interventions: A systematic review of the quantitative literature. Journal of Occupational Rehabilitation, 15, 607-631. Galinsky, E., Bond, J.T., & Sakai, K. (2008). 2008 national study of employers. Families and Work Institute (http://familiesandwork.org/site/research/reports/2008nse.pdf). Gilbody, S., Bower, P., Fletche, J., Richards, D., & Sutton, A.J. (2006). Collaborative care for depression: A cumulative meta-analysis and review of longer-term outcomes. Archives of Internal Medicine, 166, 2314-2321. Goldberg, R.J., & Steury, S. (2001). Depression in the workplace: Costs and barriers to treatment. Psychiatric Services, 52, 1639-1643. Granberry, S.W., Attridge, M., Cahill, T., & Herlihy, P. (2013). National Behavioral Consortium: Industry profile of external EAP vendors. (http://www.nbcgroup.org/). Greenberg, P.E., Fournier, A., Sisitsky, T., Pike, C.T., & Kessler, R.C. (2015). The economic burden of adults with major depressive disorder in the United States (2005 and 2010). Journal of Clinical Psychiatry, 76, 155-162. Greenberg, P.E., Kessler, R.C., Birnbaum, H.G., Leong, S.A., Lowe, S.W., Berglund, P.A., & Corey-Lisle, P.K. (2003). The economic burden of depression in the United States: How did it change between 1990 and 2000? Journal of Clinical Psychiatry, 64, 1465-1475. Hollon, S.D. (2016). The efficacy and acceptability of psychological interventions for depression: Where we are now and where we are going. Epidemiology and Psychiatric Sciences, 25, 295-300. Hultin, H., Lindholm, C., & Möller, J. (2012). Is there an association between long-term sick leave and disability pension and unemployment beyond the effect of health status? A cohort study. PLOS ONE, 7, 4. Hunt, H.A. (2009). The evolution of disability management in North American workers' compensation programs. W.E. Upjohn Institute for Employment Research (http://research.upjohn.org/). Integrated Benefits Institute. (2013). IBI chronic disease profile: Depression. (http://www.ibiweb.org/research-resources/detail/chronic-disease-profile-depression). Joyce, S., Modini, M., Christensen, H., Mykletun, A., Bryant, R., Mitchell, P., & Harvey, S. (2016). Workplace interventions for common mental disorders: A systematic meta-review. Psychological Medicine, 46, 683-697. Kaspin, L.C., Gorman, K.M., & Miller, R.M. (2013). Systematic review of employer-sponsored wellness strategies and their economic and health-related outcomes. Population Health Management, 16, 14-21. Kessler, R.C., Akiskal, H.S., Ames, M., Birnbaum, H., Greenberg, P., Hirschfeld, R., Jin, R., Merikangas, K.R., Simon, G.E., & Wang, P.S. (2006). Prevalence and effects of mood disorders on work performance in a nationally representative sample of U.S. workers. American Journal of Psychiatry, 163, 1561-1568. Kessler, R.C., Berglund, P., Demler, O., Jin, R., Koretz, D., Merikangas, K.R., Rush, A.J., Walters, E.E., & Wang, P.S. (2003). The epidemiology of major depressive disorder. Results from the National Comorbidity Survey Replication (NCS-R). JAMA, 289, 3095-3105. Kessler, R.C., Berglund, P., Demler, O., Merikangas, K.R., & Walters, E.E. (2005). Lifetime prevalence and age-of-onset distributions of DSM-IV disorders in the National Comorbidity Survey Replication. Archives of General Psychiatry, 62, 593-602. Kessler, R.C., Borges, G., & Walters, E.E. (1999). Prevalence of and risk factors for lifetime suicide attempts in the National Comorbidity Survey. Archives of General Psychiatry, 56, 617-626. Kupfer, D.J., Frank, E., & Perel, J.M. (1989). The advantage of early treatment intervention in recurrent depression.Archives of General Psychiatry, 46, 771-775. Lam, R.W., Lutz, K., Preece, M., Cayley, P.M., & Walker, A.B. (2011). Telephone-administered cognitive-behavioral therapy for clients with depressive symptoms in an employee assistance program: A pilot study. Annals of Clinical Psychiatry, 23, 11-16. Lam, R.W., Wolinsky, D., Kinsella, C., Woo, C., Cayley, P.M., & Walker, A.B. (2012). The prevalence and impact of depression in self-referred clients attending an employee assistance program. Journal of Occupational and Environmental Medicine, 54, 1395-1399. Lerner, D., Adler, D., Hermann, R.C., Chang, H., Ludman, E.J., Greenhill, A., Perch, K., Mcpeck, W., & Rogers, W.H. (2012). Impact of a work-focused intervention on the productivity and symptoms of employees with depression. Journal of Occupational and Environmental Medicine, 54, 128-135. Lerner , D., Adler, D., Hermann, R.C., Rogers, W.H., Chang, H., Thomas, P., Greenhill, A., & Perch, K. (2010). Depression and work performance: The Work and Health Initiative Study. In I.Z. Schultz & E. Rogers, S. (Eds. ), Work Accommodation and Retention in Mental Health (pp. 103-120). New York, NY: Springer. Lerner, D., Adler, D.A., Rogers, W.H., Chang, H., Greenhill, A., & Azocar, F. (2017). The double burden of work stress and depression: A workplace intervention to improve functional performance and mental health. In C.L. Cooper & J.C. Quick (Eds. ), Handbook of stress and health: A guide to research and practice (pp. 147-167). New York, NY: John Wiley. Lerner, D., Adler, D.A., Rogers, W.H., Chang, H., Greenhill, A., Cymerman, E., & Azocar, F. (2015b). A randomized clinical trial of a telephone depression intervention to reduce employee presenteeism and absenteeism. Psychiatric Services, 66, 570-577. doi.org/10.1176/appi.ps.201400350. Lerner, D., & Henke, R.M. 2008). What does research tell us about depression, job performance, and work productivity?Journal of Occupational and Environmental Medicine, 50, 401-410. Lerner, D., Lyson, M., Sandberg, E., & Rogers, W.H. (2017). The high costs of mental illness: Facts for employers. One Mind Initiative (http://onemind.org/One-Mind-Initiative). Luciano, A.E., Bond, G.R., & Drake, R.E. (2014). Does employment alter the course and outcome of schizophrenia and other severe mental illnesses? A systematic review of longitudinal research. Schizophrenia Research, 159, 312-321. Macy, G., Watkins, C., Lartey, G., & Golla, V. (2017). Depression screening, education, and treatment at the workplace: A pilot study utilizing the CDC Health Scorecard. Journal of Workplace Behavioral Health. doi.org/10.1080/15555240.2017.1282826. Mann, D.R., Mamun, A., & Hemmeter, J. (2015). Employment, earnings, and primary impairments among beneficiaries of Social Security disability programs. Social Security Bulletin, 75, 19-40. Mathers, C., Fat, D.M., & Boerma, J.T. (2008). The global burden of disease: 2004 update. Geneva, Switzerland: World Health Organization. Matos, K., & Galinsky, E. (2014). 2014 national study of employers. Families and Work Institute (http://familiesandwork.org/downloads/2014NationalStudyOfEmployers.pdf). Mattke, S., Liu, H., Caloyeras, J.P., Huang, C.Y., Van Busum, K.R., Khodyakov, D., & Shier, V. (2013). Workplace wellness programs study: Final report. Santa Monica, CA: RAND Corporation. McCleary, K., Goetzel, R.Z., Roemer, E.C., Berko, J., Kent, K., & Torre, H.D. (2017). Employer and employee opinions about workplace health promotion (wellness) programs: Results of the 2015 Harris Poll Nielsen Survey. Journal of Occupational and Environmental Medicine, 59, 256-263. McCulloch, J., Ozminowski, R.J., Cuffel, B., Dunn, R.L., Goldman, W., Kelleher, D., & Comporates, A. (2001). Analysis of a managed psychiatric disability program. Journal of Occupational and Environmental Medicine, 43, 101-109. McHugh, R.K., Whitton, S.W., Peckham, A.D., Welge, J.A., & Otto, M.W. (2013). Patient preference for psychological vs. pharmacological treatment of psychiatric disorders: A meta-analytic eeview. Journal of Clinical Psychiatry, 74, 595-602. McLellan, R.K. (2017). Work, health, and worker well-being: Roles and opportunities for employers. Health Affairs, 36, 206-213. Miller, W.R., & Rollnick, S. (2002). Motivational interviewing: Preparing people to change addictive behavior (2nd ed.). New York, NY: Guilford Press. Milligan-Saville, J.S., Tan, T., Gayed, A., Barnes, C., Madan, I., Dobson, M., Bryant, R.A., Christensen, H., Mykletun, A., & Harvey, S.B. (2017). Workplace mental health training for managers and its effect on sick leave in employees: A cluster randomised controlled trial. Lancet Psychiatry. doi.org/10.1016/S2215-0366(17)30372-3. Mintz, J., Mintz, L., Arruda, M.J., & Hwang, S.S. (1992). Treatments of depression and the functional capacity to work. Archives of General Psychiatry, 49, 761-768. Modini, M., Joyce, S., Mykletun, A., Christensen, H., Bryant, R.A., Mitchell, P.B., & Harvey, S.B. (2016). The mental health benefits of employment: Results of a systematic meta-review. Australasian Psychiatry, 24, 331-336. Nieuwenhuijsen, K., Faber, B., Verbeek, J.H., Neumeyer-Gromen, A., Hees, H., Verhoeven, A.C., van der Feltz-Cornelis, C.M. & Bültmann, U. (2014). Interventions to improve return to work in depressed people. Cochrane Database of Systematic Reviews, 12, Art. No. : CD006237. doi:006210.001002/14651858.CD14006237.pub14651853. Nieuwenhuijsen, K., Noordik, E., van Dijk, F.J., & van der Klink, J.J. (2013). Return to work perceptions and actual return to work in workers with common mental disorders. Journal of Occupational Rehabilitation, 23, 290-299. Paul, R.J. (2003). Managing employee depression in the workplace. Review of Business, 24, 31-37. Philip, S., & Miller, S. (2013). Complex puzzle: How payers are managing complex and chronic care. Oakland, CA: California Healthcare Foundation (http://www.chcf.org/). Pomaki, G., Franche, R., Murray, E., Khushrushahi, N., & Lampinen, T.M. (2012). Workplace-based work disability prevention interventions for workers with common mental health conditions: A review of the literature. Journal of Occupational Rehabilitation, 22, 182-195. Prottas, D.J., Diamante, T., & Sandys, J. (2011). The U.S. domestic workforce use of employee assistance support services: An analysis of ten years of calls. Journal of Workplace Behavioral Health, 26, 296-312. Reme, S.E., Grasdal, A.L., Løvvik, C., Lie, S.A., & Øverland, S. (2015). Work-focused cognitive-behavioural therapy and individual job support to increase work participation in common mental disorders: A randomised controlled multicentre trial. Occupational and Environmental Medicine. doi:10.1136/oemed-2014-102700. Rhodes, T. (2015). DMEC 2014 behavioral risk survey. (http://www.dmec.org/). Richmond, M.K., Pampel, F.C., Wood, R.C., & Nunes, A.P. (2015). The impact of employee assistance services on workplace outcomes: Results of a prospective, quasi-experimental study. Journal of Occupational Health Psychology. doi.org/10.1037/ocp0000018. Richmond, M.K., Pampel, F.C., Wood, R.C., & Nunes, A.P. (2016). Impact of employee assistance services on depression, anxiety, and risky alcohol use: A quasi-experimental study. Journal of Occupational and Environmental Medicine, 58, 641-650. Richmond, M.K., Shepherd, J.L., Pampel, F.C., Wood, R.C., Reimann, B., & Fischer, L. (2014). Associations between substance use, depression, and work outcomes: An Evaluation study of screening and brief intervention in a large employee assistance program. Journal of Workplace Behavioral Health, 29, 1-18. Roelen, C.A., Norder, G., Koopmans, P.C., van Rhenen, W., van der Klink, J.L., & Bültmann, U. (2012). Employees sick-listed with mental disorders: Who returns to work and when? Journal of Occupational Rehabilitation, 22, 409-417. Rössler, W., & Drake, R.E. (2017). Psychiatric rehabilitation in Europe. Epidemiology and Psychiatric Sciences. doi.org/10.1017/S2045796016000858. Rost, K.M., Marshall, D., Shearer, B., & Dietrich, A.J. (2011). Depression care management: Can employers purchase improved outcomes? Depression Research and Treatment. doi:10.1155/2011/942519. Rost, K.M., Marshall, D., & Xu, S. (2014). Intervention impact on depression product appraisal and purchasing behavior by employers: A randomized trial. BMC Health Services Research, 14, 426. doi:410.1186/1472-6963-1114-1426. Rost, K.M., Smith, J.L., & Dickinson, M. (2004). The effect of improving primary care depression management on employee absenteeism and productivity. A randomized trial. Medical Care, 42, 1202-1210. Rush, A.J. (2015). Isn't it about time to employ measurement-based care in practice? American Journal of Psychiatry, doi.org/10.1176/appi.ajp.2015.15070928. Schoenbaum, M., Unützer, J., McCaffrey, D., Duan, N., Sherbourne, C., & Wells, K.B. (2002). The effects of primary care depression treatment on patients' clinical status and employment. Health Services Research, 37, 1145-1158. Schuring, M., Robroek, S.J., Otten, F.W., Arts, C.H., & Burdorf, A. (2013). The effect of ill health and socioeconomic status on labor force exit and re-employment: A prospective study with ten years follow-up in the Netherlands. Scandanavian Journal of Work, Environment and Health, 39, 134-143. Shippee, N.D., Shah, N.D., Angstman, K.B., DeJesus, R.S., Wilkinson, J.M., Bruce, S.M., & Williams, M.D. (2013). Impact of collaborative care for depression on clinical, functional, and work outcomes: A practice-based evaluation. Journal of Ambulatory Care Management, 36, 13-23. Shojania, K.G., & Grimshaw, J.M. (2005). Evidence-based quality improvement: The state of the science. Health Affairs, 24, 138-150. Simon, G.E., Barber, C., Birnbaum, H.G., Frank, R.G., Greenberg, P.E., Rose, R.M., Wang, P.S., & Kessler, R.C. (2001). Depression and work productivity: The comparative costs of treatment versus nontreatment. Journal of Occupational and Environmental Medicine, 43, 2-9. Skisak, C.M., Bhojani, F., & Tsai, S.P. (2006). Impact of a disability management program on employee productivity in a petrochemical company. Journal of Occupational and Environmental Medicine, 48, 497-504. Smith, J.L., Rost, K.M., Nutting, P.A., Libby, A.M., Elliott, C.E., & Pyne, J.M. (2002). Impact of primary care depression intervention on employment and workplace conflict outcomes: Is value added? Journal of Mental Health Policy and Economics, 5, 43-49. Society for Human Resource Management. (2009). 2009 employee benefits. White Paper. Alexandria, VA (http://www.shrm.org/). Spetch, A., Howland, A., & Lowman, R.L. (2011). EAP utilization patterns and employee absenteeism: Results of an empirical, 3-year longitudinal study in a national Canadian retail corporation.Consulting Psychology Journal: Practice and Research, 63, 110-128. Stam, K., Sieben, I., Verbakel, E., de Graaf, P.M., & Stam, K. (2016). Employment status and subjective well-being: the role of the social norm to work. Work, Employment and Society, 30, 309-333. Stewart, W.F., Ricci, J.A., Chee, E., Hahn, S.R., & Morganstein, D. (2003). Cost of lost productive work time among US workers with depression. JAMA, 289, 3135-3144. Tan, L., Wang, M., Modini, M., Joyce, S., Mykletun, A., Christensen, H., & Harvey, S.B. (2014). Preventing the development of depression at work: A systematic review and meta-analysis of universal interventions in the workplace. BMC Medicine, 12, 74 doi:10.1186/1741-7015-1112-1174. Taranowski, C.J., & Mahieu, K.M. (2013). Trends in employee assistance program implementation, structure, and utilization, 2009 to 2010. Journal of Workplace Behavioral Health, 28, 172-191. Thase, M.E., Wright, J.H., Eells, T.D., Barrett, M.S., Wisniewski, S.R., Balasubramani, G.K., McCrone, P., & Brown, G.K. (2017). Improving the efficiency of psychotherapy for depression: Computer-assisted versus standard CBT. American Journal of Psychiatry, AJP in Advance. doi: 10.1176/appi.ajp.2017.17010089. Thota, A.B., Ann Sipe, T.A., Byard, G.J., Zometa, C.S., Hahn, R.A., McKnight-Eily, L.R., Chapman, D.P., Abraido-Lanza, A.F., Pearson, J.L., Anderson, C.W., Gelenberg, A.J., Hennessy, K.D., Duffy, F.F., Vernon-Smiley, M.E., Nease, D.E. Jr., & Williams, S.P. (2012). Collaborative care to improve the management of depressive disorders: A community guide systematic review and meta-analysis. American Journal of Preventive Medicine, 42, 525-538. Timbie, J.W., Horvitz-Lennon, M., Frank, R.W., & Norman, S.T. (2006). A meta-analysis of labor supply effects of interventions for major depressive disorder. Psychiatric Services, 212-218. Trivedi, M.H., Morris, D.W., Wisniewski, S.R., Lesser, I., Nierenberg, A.A., Daly, E., Kurian, B.T., Gaynes, B.N., Balasubramani, G.K., & Rush, A.J. (2013). Increase in work productivity of depressed individuals with improvement in depressive symptom severity. American Journal of Psychiatry, 170, 633-641. Unützer, J., Katon, W., & Callahan, C.M. (2002). Collaborative care management of late-life depression in the primary care setting: A randomized controlled trial. JAMA, 288, 2836-2845. VanLare, J.M., & Conway, P.H. (2012). Value-based purchasing: National programs to move from volume to value.New England Journal of Medicine, 367, 292-295. Waddell, G., & Burton, A.K. (2006). Is work good for your health and well-being? London: Stationery Office. Wang, P.S., Lane, M., Olfson, M., Pincus, H.A., Wells, K.B., & Kessler, R.C. (2005). Twelve-month use of mental health services in the United States: Results from the National Comorbidity Survey replication. Archives of General Psychiatry, 62, 629-640. Wang, P.S., Patrick, A., Avorn, J., Azocar, F., Ludman, E., McCulloch, J., Simon, G., & Kessler, R. (2006). The costs and benefits of enhanced depression care to employers. Archives of General Psychiatry, 63, 1345-1353. Wang, P.S., Simon, G., & Kessler, R.C. (2003). The economic burden of depression and the cost-effectiveness of treatment. International Journal of Methods in Psychiatric Research, 12, 22-33. Wang, P.S., Simon, G.E., Avorn, J., Azocar, F., Ludman, E.J., McCulloch, J., Petukhova, M., & Kessler, R.C. (2007). Telephone screening, outreach, and care management for depressed workers and impact on clinical and work productivity outcomes: A randomized controlled trial. JAMA, 298, 1401-1411. Warr, P. (1987). Work, unemployment, and mental health. Oxford: Oxford University Press. Wells, K.B., Sherbourne, C., Schoenbaum, M., Duan, N., Meredith, L., Unützer, J., Miranda, J., Carney, M.F., & Rubenstein, L.V. (2000). Impact of disseminating quality improvement programs for depression in managed primary care: A randomized controlled trial. JAMA, 283, 212-220. Yur'yev, A., Värnik, A., Värnik, P., Sisask, M., & Leppik, L. (2010). Employment status influences suicide mortality in Europe. International Journal of Social Psychiatry. doi: 10.1177/0020764010387059.